Quinn still has feelings for you, but you decided to keep your relationship strictly professional. You ended your romance with Quinn. Quinn came crawling back to ask for your forgiveness, but you could not forgive him. Quinn is now locked away in an Eternal Alliance prison. 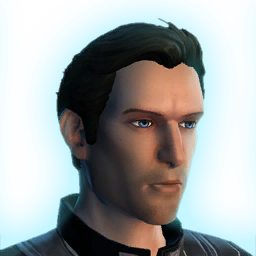 Quinn came crawling back to ask for forgiveness, but you couldn't forgive him for betraying you to Darth Baras all those years ago. As payment for his treachery, you ended Quinn's life. After meeting you on Iokath, Malavai Quinn has joined you as a member of the Eternal Alliance. Despite your time apart, your love for Quinn is stronger than ever. You've decided to continue your romance. Because of his contempt for the Republic, Quinn chose not to join the Alliance. Quinn reunited with you on Iokath, but you chose to go your separate ways. After reuniting with Malavai Quinn and renewing your relationship, things have changed and you no longer care for him in the same way.